VOX has been a recognizable name for a very long time. Their product history is very impressive as is the long list of respected guitarists that swear by VOX amps. You can get the plugin on it’s own or as part of the VOX Amplug I/O. It’s a full amp suite that features 19 amps, 12 cabinets and about 90 other components ranging from pedals to processing, modulation and more so it’s an attractive suite. It looks like POD Farm and the GUI is laid out a bit like POD Farm. Everything is laid out fairly conveniently and it’s easy to figure everything out fairly quickly. There is however a ton of clutter in the GUI that can make it a bit of a mess. A good starting point tone when you open a plugin is always nice but Jam Vox III doesn’t really give you much to work with in that regard. I started into the presets and while doing so, I was constantly wondering why there was reverb, delay or echo on literally every preset in the list. It’s easy to bypass and remove things in the chain but the presets didn’t do much to show me around the plugin’s capabilities. The message in a bottle presets were cool but the rest, not so much. The clean tones are reasonable and sounded like they could be useful in a pinch. I had a few tones for blues, country, jazz and southern rock that I enjoyed jamming on for the sessions. The note response was great and the resonance impressed me but there was no real warmth to the tone. I heard a few things I really liked when I attempted a driven blues tone. I warmed it up with the PSP Vintage Warmer to where it was usable but still there was no real character to anything. From mid to hi-gain, this suite loses me for the most part. I was able to use the Bogner and a couple other amps with the fuzz pedal to create some very cool stoner/doom tones but otherwise, nothing in the crunchy to shreddy areas of the suite provided much to talk about. The Bogner looking amp was fun to use and there’s a Marshall faced amp with loads of gain that also brought some jammable tones so the angrier sections of the suite aren’t a complete wash. I just couldn’t see myself ever reaching for this software with everything else that’s out there. Jam Vox includes a pretty impressive assortment of pedals to play around with. The quality is fairly average but you can get some use out of the pedals if you take time to really dial them in. They all give you a little of the signature effect involved with each pedal. I would call them competent. The impulses are again, pretty average across the board. None of the cabs really enhance the tone much, they simply get you into the neighborhood. I had some success with my own impulses but all in all, it didn’t make a world of difference. 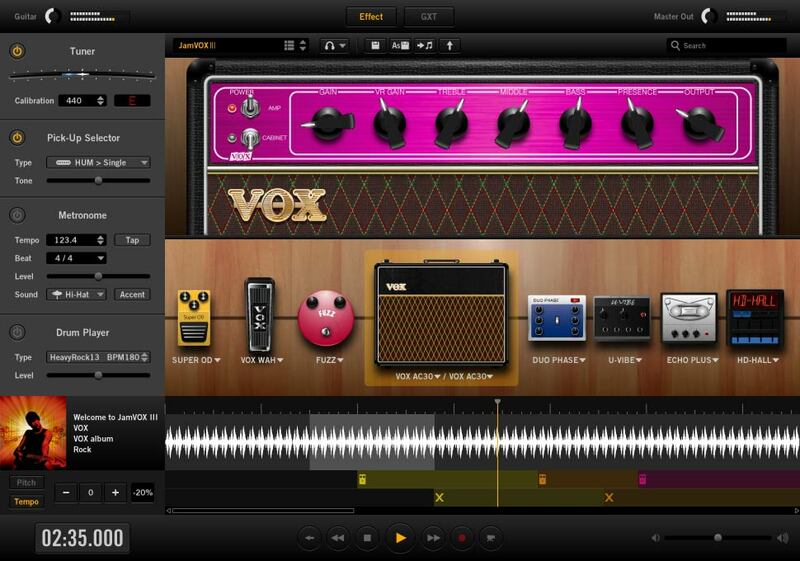 Jam Vox III also has a few features that might work out great for beginners or young players. A movie recording feature to use to record videos of your playing and a music player to play along to your favorite songs or maybe songs that you might be learning. Jam Vox III is a recreational type plugin and I would actually recommend programs like it or POD Farm for younger and beginner users. It’s really great for use with Amplug I/O, I thought that whole set up was pretty cool. The movie maker and music player further confirm for me that the plugin is a recreational solution best for jamming at home. On the downside, if you are looking for a good sounding recording solution or a plugin to provide above average results on any level, Jam Vox III is not for you. The price for the plugin itself hurts it as well. If you buy the AmPlug I/O however, you get the software free and AmPlug is less than half the price of buying the software outright. Why not pay half price and get a fun little simple wireless interface that plugs right into your guitar?